These clever little cufflinks are made from upcycled bike chains that would otherwise go to waste. Katie's Bike pieces originate from the United Kingdom. 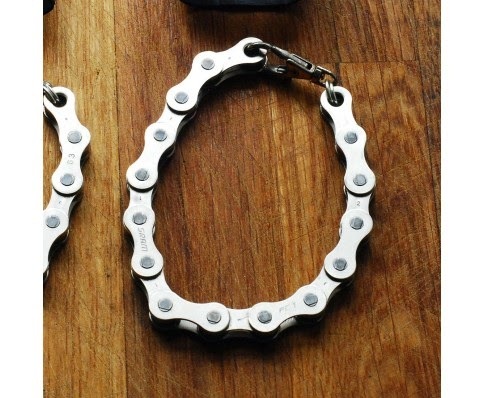 Katie makes bespoke jewellery and accessories from used bike chains that she sources from workshops around London. Intrigued to know more, I've asked Katie a few questions related to her small upcycled business and her original inspiration behind the idea. Q. 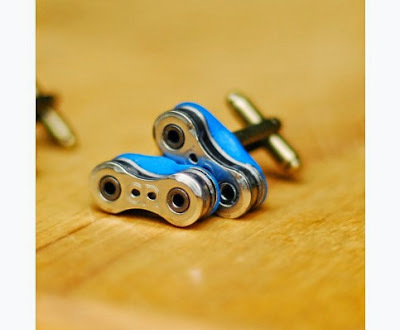 What inspired you to start making jewellery out of recycled bike parts? My boyfriend is a bicycle mechanic so he got me started with my first used components. I delinked an old chain to make a necklace and had a eureka moment. I'm sure others have been put off in the past because the chains need a lot of cleaning, but they're a great available resource for jewellery. Having studied environmental design I'm very interested in sustainability and resource awareness. Creating a business incorporating jewellery design and sustainability is a dream come true. Q. Are you a Jeweller by trade? I studied Architecture and Environmental Design, and had a career in Building Services Engineering before I started Katie's Bike. I've been making jewellery as a hobby since I can remember and took a few courses in goldsmithing, which I love. When I grew tired of my Engineering job I knew I wanted to be self employed and decided to try my hand as a jewellery designer. 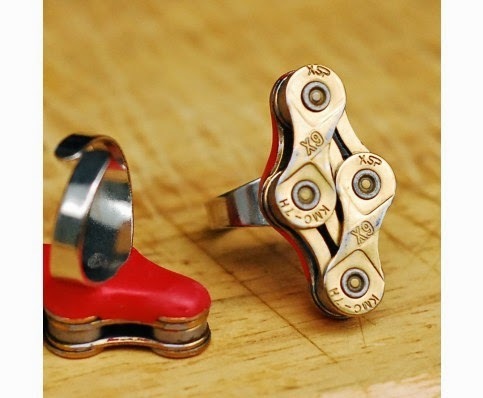 I had a few different ideas for jewellery businesses but the bike chain bling seemed to be a great niche. The trifecta that is design, cycling and recycling gives me plenty of avenues to develop my brand. Q. Is 'Katie's Bike' your sole business, or a side hobby/business? It's my sole business. I had a very demanding career before and knew that if I pursued both, neither would succeed. I had worked part time while completing my Masters degree and hated it. I felt like I couldn't give 100% to either, and thus felt like a failure in both. So I saved up a bit of money then quit my job. The first thing I did (the day after I left work) was take a 6 day Jewellery Business Bootcamp. That was the best decision I've made and I would highly recommend a bootcamp to anyone looking to start a new business. Q. Do you have regular bike shops that supply you with your bike parts, or do you scour many? I've developed relationships with a few bike shops I keep going back to, but as the business grows I'm adding new ones. The shops are happy to put the chains aside for me as it means less waste for them. They also have great ideas about new products and most are really interested in supportive of what I'm doing. Most of the shops I collect from are also stockists which is an excellent selling point. Q. Which piece is your most popular? The cufflinks and the play hard bracelets. The first cufflinks I did were fixed using epoxy resin. They worked OK but epoxy resin is a horrible adhesive to work with because it's messy and smelly. I then found an amazing silicon based adhesive called sugru. It's manufactured in London and America and comes in primary colours which can be mixed to make any colour you like. I now make both the 'classic' cufflinks using epoxy and the coloured ones using sugru. Both are equally popular. If it were up to me though, I'd go coloured and I recommend sugru to everyone I can. Q. 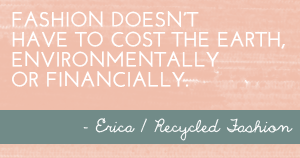 Do you have any more recycled designs or ideas coming up in the future? How inspiring! Thank you Katie, and all the best to you and your creative business. 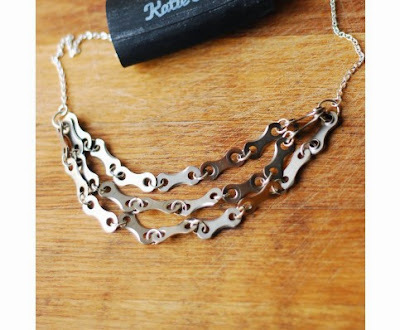 You can find the full range of Katie's Bike bespoke jewellery pieces and accessories on The Lost Lanes online marketplace. 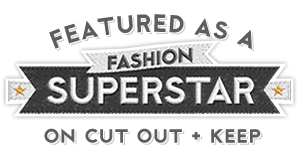 Disclaimer: this blog post is not sponsored, Katie has no clue who I am, I just happen to think her funky upcycled bike chain pieces are pretty impressive! They are gorgeous pieces - so clever and yet so beautiful. What an interesting career path she took before landing on this one! Fascinating to read. How creative! Love these pieces. Oooh - I had a bike chain bracelet many many MANY years ago...where did I buy it? Maybe at a motorbike show...who knows? It was cool though and lots of people commented on it. Nice recycling idea.